Set sail from Ushuaia on your 11-night Ultimate Antarctica Cruise with Scenic Eclipse. 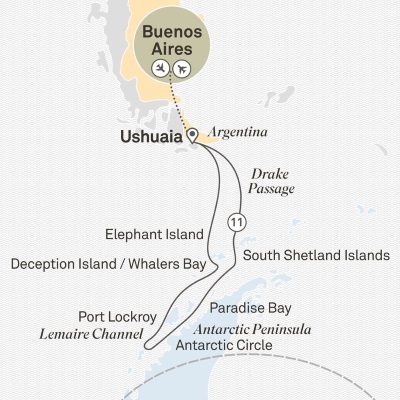 Your journey into wonder begins today with a flight from Buenos Aires to Ushuaia. Relax and raise your glass to the days ahead at this evening’s welcome reception. Cruising and arrive at the South Shetland Islands this afternoon. Cruising Drake Passage. Farewell Dinner. Disembark with a lifetime of wonderful memories and board your flight to Buenos Aires.